Collectively, we have over 50 years experience performing home inspections, as Passaic County NJ Home Inspectors. We also service all of Northern and Central NJ. We give you the best, most thorough, in-depth home inspection in New Jersey. We identify flaws or issues that other inspection companies may miss, potentially saving you thousands of dollars in future repairs, and helping you negotiate cost concessions to address these issues before you buy the home. The price of the inspection is typically covered many times over by these repair savings and cost concessions. That’s THIS value! “A picture is worth a thousand words“. On an average home inspection we take over 100 photos. Most of these are incorporated in the report alongside anything to discuss. You can see what we are writing about. It’s like being at the inspection all over again. Click here to view THIS Sample Inspection Report. 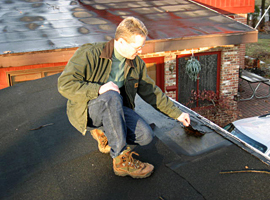 On larger, more complex homes or commercial buildings, we will send two inspectors. Two pairs of eyes are better than one. Our loyalty is to you, our client, and we want to ensure that you know everything possible about your home, so that you are comfortable about your decision to purchase. The basement is where we usually find the juicy stuff. Heating system, water heater, electrical panel, sump pump and A/C system are all inspected and tested. We are particularly looking out for any evidence of water entry through basement walls or floor, foundation cracks, mold and termites. 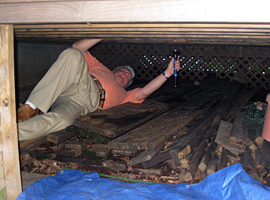 If there is a crawlspace we check that out for ventilation, insulation, dampness and structural condition. As Passaic County NJ Home Inspectors, THIS is proud to service all of Central and Northern NJ.